I am always so happy to see bushels of fresh fall vegetables at the store! My husband has been asking about sweet potatoes for a few weeks now. When I saw these at 49 cents a pound, I splurged--I'll wait until they dip to 35 cents a pound for the big stock up, usually closer to Thanksgiving. My personal favorite is the turnip. It's such a uniquely beautiful vegetable. If you don't believe me, flip through the Graham Rust illustrations in your library's copy of The Fine Art of Dining.I love its sweet and slightly bitter flavor. Unsure how to cook them? Hillbilly Housewife has two no-fail methods: Mashed Turnips and My Best Turnips. Those turnips look fantastic. I agree with you about their beauty. I love their color. I don't like them cooked, though. I only eat them raw (but they're delicious that way)! After your move, are you still in the same parish? If so, is the building project close to finished? I think the projected move-back-in date was in November, but I may be misremembering. I only go there when I'm at home (Summer and Christmas breaks), so I'm slightly out of the loop. I like to roast root vegetables and them use them for a great vegetable broth for the freezer. I also use vegetables for still lifes in the kitchen and on the table. It is interesting since in Japan I bring home some things for the looks, then have to ask a neighbor what to do with it. Recently we had to eat quit a bit of daikon radish due to this. I made a rutabaga lantern for Halloween this year. I was very happy with how it turned out. I have a "glazed" recipe I use for turnips and rutabagas. I think plain and mashed is still the best, though. So, Happy Halloween in your new home! 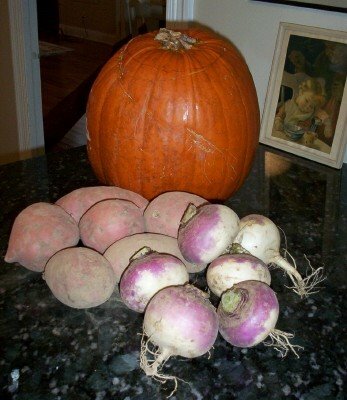 Weren't rutabagas the first jack o' lanterns, anyway? I have yet to try cooking one! I do love daikon, though, diced in stir fries.